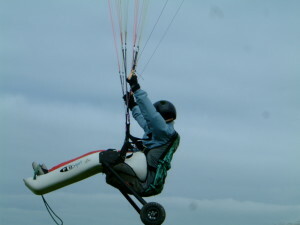 The Sanderson buggy being flown solo. 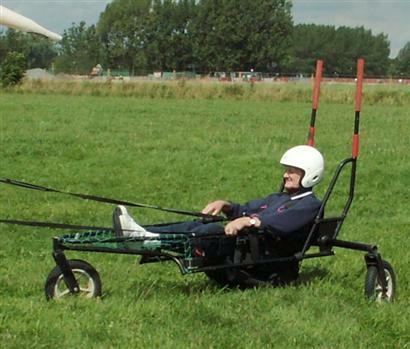 PLEASE NOTE: the specialist equipment described below is intended to be used by suitably qualified pilots, instructors and student pilots under instruction. All the specialist equipment illustrated below has been designed and manufactured by professionals for the purpose of free-flying. Flyability has a range of specialist flying equipment available for loan to BHPA schools, clubs and pilots. The Swanton buggy on the ground. If you are interested in borrowing specialist equipment from Flyability please contact Flyability Equipment Officer on +44 (0)17687 73040 or email us at contact@flyability.org.uk and we will pass on the message. We’ve also got some articles from specialist equipment designers from around the world. These are available to browse in our Equipment category.